Chios Mastiha facts Mastiha production in Chios depends on weather conditions as well as other, random events, such as wildfires, but in general terms, it amounts to 120-150 tons a year. Exports account for 70 percent of total sales, while the major exporting markets are the Middle East, and several countries in North Africa (Morocco, Mauritania etc.) where Chios Mastiha is used as flavoring and spice, as well as the EU, the US, Japan, Korea, Turkey, and Cyprus, where it is mainly used in cosmetics, cooking, and pharmaceuticals. The role of the Growers Association The Chios Mastiha Growers Association was founded in 1938 as a compulsory agricultural cooperative according to Law 1390 and represents an entity that has undertaken the exclusive management of natural Chios Mastiha in Greece and abroad. It is the collective representative organ of 20 primary cooperatives founded in the 24 Mastiha villages (Mastihohoria) of southern Chios. 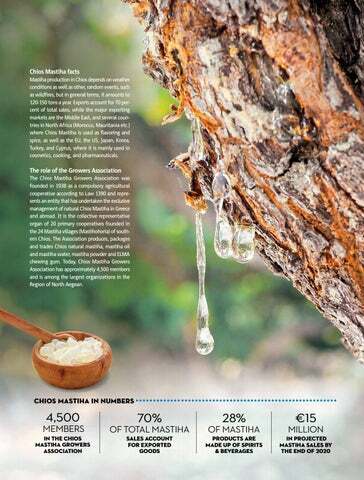 The Association produces, packages and trades Chios natural mastiha, mastiha oil and mastiha water, mastiha powder and ΕLMA chewing gum. Today, Chios Mastiha Growers Association has approximately 4,500 members and is among the largest organizations in the Region of North Aegean.